For a moment on Tuesday, Twitter was normal. It was still a fast-paced and volatile echo-chamber brimming with misinformation and inscrutable hashtags, but at least it was familiar. Then Burger King decided to mess everything up by tweeting what was presumably a typo. Or was it? The tweet reading "mp; saf" had echoes of the president's very dumb "covfefe" tweet, which inspired its own fan fiction but was very obviously a mistake. Whether Burger King was surreptitiously planting some kind of warning or sneakily instituting a marketing campaign didn't really matter, as the brand's followers quickly got involved in the company's mentions. The multiple entreaties made by fans for the help of Wendy's, which is known for its scorching insults and barbs on Twitter, went unanswered. In the past, we've seen fast food companies use Twitter to remind the public of their existence, with rap battles and other weird repartees taking place, so it's no surprise that Wendy's was summoned. According to a Burger King spokesperson, the company's cryptic tweet was made in reference to a Twitter meme. "It was a weird meme type pop culture trending topic on twitter yesterday – and BK chimed in, just like everyone else :) No other explanation or meaning behind it," the company wrote in an email. 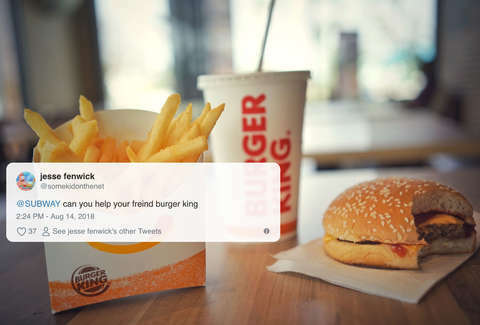 To be perfectly honest, it's hard to imagine Burger King at the forefront of the meme discourse, and doubly hard to imagine the chain usurping the meme reporters at Thrillist when it comes to the happenings of weird Twitter. But hey, stranger things have happened!